Initially sparked by a joint interest in the existential writing of Yoel Hoffman, Bezalel Academy of Arts and Design students Tal Kantor and Shahar Davis set out to explore questions of the materiality of things in Under The Small Sun, their utterly charming tale of a friendly cockroach who leads a lonely man into a surreal infinite desert. DN invited Tal and Shahar to explain how their philosophical explorations influenced the film’s narrative and character design, and why you might want to reconsider casting a hexapod in your next animation. Our film is inspired by a text from a novel by Israeli writer, Yoel Hoffman, The Heart is Katmandu. It is a very lyrical and existential text. We chose a very short section about a man who is preparing to leave his home. He is reminiscing about an old lost love and ponders over the meaninglessness of words. Then, when a cockroach appears in his room he has existential thoughts about the distance and proximity of himself and the other being – the cockroach. Those themes of existentiality and problems of representation echoed with our frustration with the virtualization and alienation of our world. We were troubled by what we believed to be an unbridgeable gap between representation (and perception) and reality. We believed that reality is located in the materiality of things and that we can not grasp it with our minds. This led us to a process of gradually abandoning representation and focusing on the materiality of the film. Our starting point was a fascination with macro lenses. Naively we imagined that if we looked closer at something, at its texture, then we get closer to its realness. 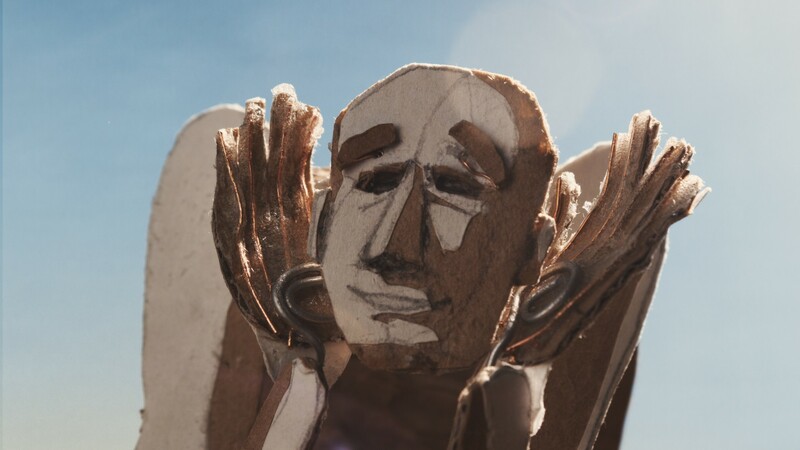 This led us to create a very small character, whose cardboard fibers were visible on close-up shots. We shot the film in chronologic order and developed the character and its environments as we went. Part of the idea was to deconstruct the character and the environment gradually from shot to shot. In the last part of the film we exposed the back side of the stop-motion puppet, to reveal its mechanism. This is a metaphor for the process that the character went through. We decided to end the film on a positive note by having the character experience a moment of grace during his encounter with the other being, the cockroach. Part of the idea was to deconstruct the character and the environment gradually from shot to shot. Shira Legmann’s original music continued with the theme of the materiality with regards to the sound. It was inspired by John Cage’s prepared piano – a piano in which objects placed between the strings alter the sound and accentuate its materiality. Shira not only played the piano on this film, but also used a small toy piano, to achieve a different effect when the cockroach is walking. The film took about a year to complete; We shot with a Canon T4i and used an old Canon 50mm FD lens with an adaptor for macro shots. We also used reference video of ourselves for the animation. Shahar choreographed the dance and on the basis of his movements we built the character’s dance at the end of the movie. To capture the desert scenes, we shot the character on a green screen and created the desert background in 3DS MAX. Animating a creature with six legs and two antennae turned out to be a difficult challenge. Sometimes took ten minutes in order to shoot a single frame of a step of the cockroach. Under The Small Sun signifies our interest in the materiality of representation which continued to be the theme of our graduation films, both of which will be screened in next month’s Annecy Animation Film festival.